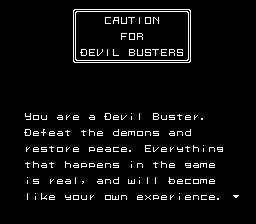 This is a translation patch for Megami Tensei 2 for the NES. All menus are translated, along with a good amount of miscellaneous text. Only the introduction is translated of the story. 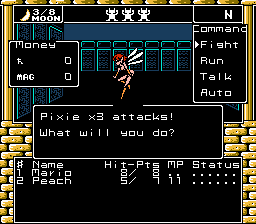 Most terminology is inspired from the SNES translation, including demon and item names. The main purpose of this release is to serve as a proof of concept. I do not speak Japanese myself, but I want to see the game translated. The translation quality itself is currently quite rough. Please report any issues found to do with the menus. Translation help will be appreciated. Credits: Hacking work done by me. Terminology largely inspired by DDSTranslation's work on the SNES version. That patch does not translate the majority of the terminology. To quote its website, 10% of item names and 68% of enemy names are translated there. This patch translates 100% of both. Some of the menus are easier to understand as well; that patch just has up and down arrows in place of buy/sell prompts due to space limitations. This patch has those options written out as Buy and Sell. This patch also uses a lowercase font, as opposed to the ALLCAPS in the current patch. On the other side of the coin, more of the story is translated in that patch, but it still doesn't translate too far into the game and missing dialogue is a common occurrence. 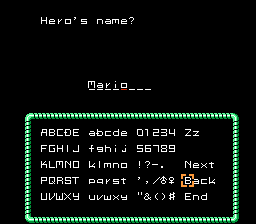 What dialogue is there was most likely directly entered from a hex editor as none of the dialogue has been repointed. In short, while this patch doesn't translate the story or conversations, it should translate most of the rest. That patch translates an amount of the story, and not that much else. Well, any effort for this one is always welcome. Hopefully you'll find a translator around here for this game. I would suggest Tom, but I don't know how he'll be about his time (if I'm not wrong, he's translating Otaku no Seiza (The Constellation Nerdulus) from Famicom, aside his work on Zill O'll from PSP. Nonetheless he has proven to be THE MAN for the Megaten series too much (best proof is to get all Last Bible games translated). Thanks for the explanation. I'm a big fan of the series, but I've been waiting for this one to get fully translated before giving the original two a try. I'm looking forward to this. This ^^^ - Tom is by far the best if you want to get this done really well in terms of quality; you should probably ask him either here on RHDN or via Twitter (he translated the first game also, together with Pennywise). I'm sure he'd love to translate this game as well. Far be it for me to discourage someone else from pursuing a hobby, but this game has been a long gestating project for Tom and I. We haven't really done any significant work on it yet, but this game is one of Tom's most wanted translations and I told him I would hack it for him. We still intend to follow through on it and the project might just come together relatively soon after we finish another translation. So far not much has been done. 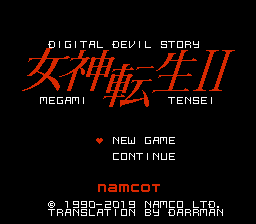 The title screen and little intro screen (I'm gonna redo my hack for this as it's kinda overkill atm) have been hacked and translated. But I'll work on the game some more and get it ready for Tom to translate. No matter how it gets there, this is a game I'm really looking forward to see translated!